CAFDEx ® Suite is our flagship Software-as-a-Service solution that we host either in your cloud or in ours. Works on devices with a modern-day web-browsers. It provides enterprise-wide capability that is easily configurable to your business processes,representing data in your own language. It's umbrella or suite structure provides a quick access to a series of web applications and services you need for your business. Software as a service (SaaS; pronounced /sæs/) is a software licensing and delivery model in which software is licensed on a subscription basis and is centrally hosted. It is sometimes referred to as on-demand software,web-based software, or hosted software. SaaS applications run on a SaaS provider’s servers. Access to CAFDEx ® University's (CAFDExU) training Subjects and Courses via online Help Guides and scheduled Brown Bag sessions. Direct feedback to analysts via CAFDEx ® Sustainment Requests (SR) for software related issues. Standardized and customized reports and graphs can be displayed or exported with integrated data from multiple sourced CAFDEx® Websystems. 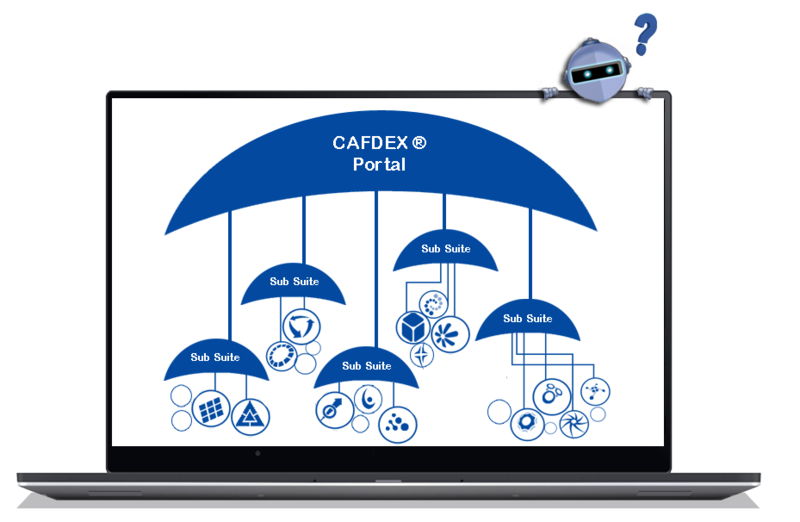 CAFDEx® Data Analytics (CADS) use centralized data and provides real-time decision support tools .Online Grids, Analytics and Reports customized to your data and configurable. CAFDEx ® User Administration and Requirement Management allows you to customize user roles and access different channels and alerts as well as subscribe to available system features and links. CAFDEx ® eCollaboration tool provides users better group discussion, reduces travel cost for team members remotely from anywhere in the world, easy access of information and required actions are done quickly. CAFDEx ® allows user to manage critical data and records to a single point reference across the enterprise. Master Data Management facilitates data quality, consistency and accuracy. Centralized Access for Document Overview (CAFDOx) allows user to upload, download , share , collaborate files conveniently and secured. CAFDEx ® Workload Tracking System (WTS) provides workload tracking and project management tools for your organization . Provides a turn-key business process to collect, record, and evaluate costs and provide corporate budget inputs, planning reports, and maintenance expense forecasting services for the development of budgets. Provides roll up and drill down capabilities that enable process users to align current and future funding with current and future year requirements. Provides inventory control, maintenance scheduling, and budgeting for company assets, consolidating equipment inventory into a single database, accessible by users worldwide, that facilitates central reporting and knowledge management. Implements the visit planning, scheduling and budgeting needed to forecast baseline and cyclical requirements thereby ensuring your capital assets are maintained and conserved. Provides collaboration capabilities for Senior Leaders that result in strategies and readiness requirements being captured and turned into actionable items through the development, collaboration and approval of Performance Based Objectives (PBOs). Need other cloud-based solution for your business? We design, develop and deliver centrally hosted applications over the internet. DoD uses CAFDEx® Maintenance Requirements Planning / Forecasting (MRP/F) service to support their Logistics Requirements Determination Process. CAFDEx® allows them to support the workflow for maintaining their Weapons System Sustainement Requirements from identification, collaboration , validation, prioritization, to publication of the Fiscal Year's brochure. HQ CAM office participates in Air Force Weapons System Sustainment (WSS) resource planning activities driven by the Air Force Corporate Structure. CAFDEx® Management Budget Allocation Planning Programming(MBA/PPBE) is their preferred tool to use for supporting budget exercises, congressional reporting and trend analysis. DodD uses the CAFDEx® Inventory and Unique Identification (I/UID) service together with CAFDEx® Maintenance Visit Planning (MVP) to support item registration, scheduling , visit projections and execution process. CAFDEx® services help their organization to meet DoD mandate requirements for Air Force Weapon Systems.